Posted in Insights, News on May 27, 2015 by Zac Flamig. The MRMS-FLASH system, running in a real-time demonstration mode for several years now, performed admirably for the recent flash flooding events in Oklahoma and Texas. The MRMS-FLASH system runs in a completely automated fashion ingesting quantitative precipitation estimates every 5-minutes from the MRMS mosaic of NEXRAD data. The FLASH hydrologic modeling system subsequently produces 6-hour forecast hydrographs for everywhere across the CONUS. On evening of May 25th, 2015 the city of Houston, Texas experienced a serious flash flooding event. MRMS precipitation estimates indicate that the western portions of the city experienced 6-8″ of rainfall. The ratio of precipitation to flash flood guidance shows exceedance values of 100-140% over this area, however some of the USGS stream gauges reporting flash flooding (blue triangles) and the flash flood local storm reports (brown circles) fall outside of this region. This product is important because it is equivalent to the main tool operational NWS forecasters have available for flash flood monitoring and prediction. 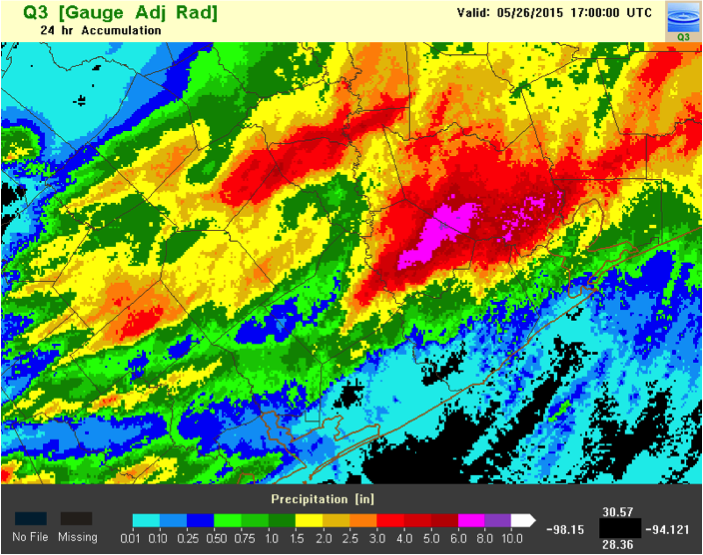 MRMS QPE to FFG Ratio for the May 25th, 2015 Houston flash flood. Blue triangles are USGS stream gauges reported flash flooding, brown circles are NWS flash flood local storm reports. The Coupled Routing and Excess Storage (CREST) distributed hydrologic model, a part of the MRMS-FLASH hydrologic modeling suite, generates maps of streamflow and unit streamflow (cubic meters per second per square kilometer) every 15 minutes. Comparisons between the observations of flash flooding and the maps of unit streamflow show a good correspondence between areas of high unit streamflows and flash flooding. Animation of unit streamflow from the May 25th, 2015 Houston Flash Flood. 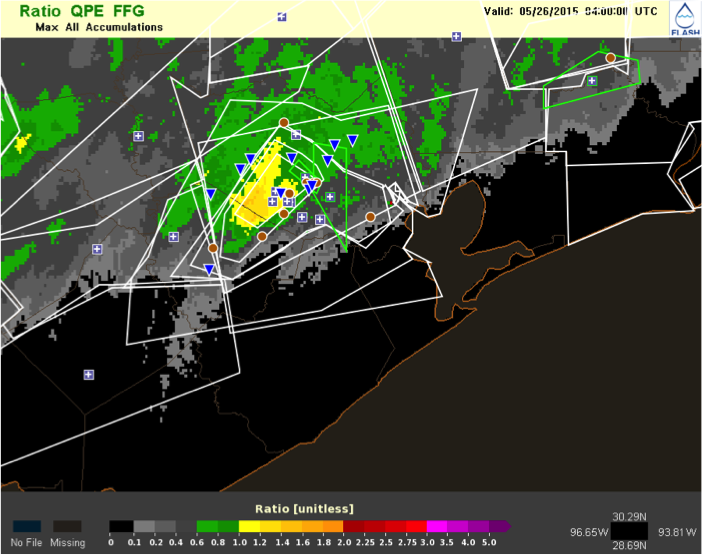 Blue triangles are USGS stream gauges reported flash flooding, brown circles are NWS flash flood local storm reports.